Are you looking for Ecwid themes? There’s a reason you’re not finding what you’re looking for. They don’t really exist. But all you’d like to do is customize your website and online store to match your brand. No worries, you are in the right place. This article is an extensive review of what “Ecwid Themes” are and how you can create yours. So Ecwid Themes per se do not actually exist. Contrary to WooCommerce and Shopify, you do not need a theme for your Ecwid Store. The reason is, Ecwid integrates any platform. Therefore, Ecwid Themes are not necessary. However, if you would like to design your Ecwid Store, there are many alternatives to a paid theme in order to do so. Ecwid allows you to design you store using Ecwid styles which designs HTML code. Thanks to Ecwid CSS codes, you can customize the look and feel of your whole Ecwid store. 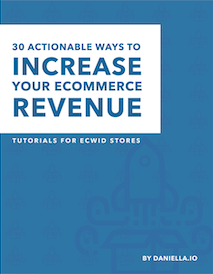 The video below demonstrates how to change your Ecwid store design. QUIZ | Best Option to Design my Ecwid Store? Knowing the best way for you to design your Ecwid store to match your brand may still seem a bit confusing. Take the quiz below to determine exactly your specific needs. Have You Used Ecwid’s Design Panel to Customize Your Store Design? In your Ecwid Control Panel > Head over to the Design tab > Choose options to design your Ecwid Store. 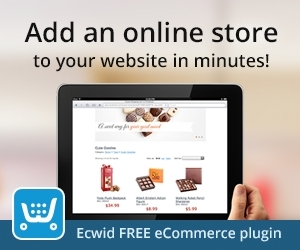 Would You Like to Add, Change, Edit or Remove Default Ecwid Items in Your Store? Here are some examples: Change the colour or size of a text. Hide a default Ecwid title in your online store. Re-position an item in your store like the add to cart bag. Would You Like to Edit Functionalities in Your Ecwid Store? Examples: Have a drop-down to select product quantities. Oblige customers to select a certain quantity of products to be able to checkout. Display slider buttons to scroll between products. Change the way bulk pricing works. Are You Looking to Add New Pages Your Ecwid Site? Like a blog, contact page, about us page etc. Check out solution #1. in this article: The Ecwid Design Panel​ and learn how to design your online store quickly and easily. In your Ecwid Control Panel > Head over to the Design tab > Choose options to design your Ecwid Store. Check out solution #2. in this article: Customize Your Store Using CSS Codes​ and learn how to design your online store quickly and easily. Ecwid CSS allows you to customize the look and feel of your Ecwid store. I promise you will not actually have to code or program anything! All the code you need is available in my Ecwid CSS eBook. Check out solution #4. in this article: Customize Your Store Using CSS Codes​ and learn how to design your online store quickly and easily. You can use a CMS or a content management system. You might have already heard of WordPress, Wix or Weebly. These are all content management systems, and they allow you to create and design websites. Save time searching for codes in the Ecwid forums and support site! Everything you need is all in one place in this eBook. Learn how to Change, Add, Remove and Edit Items to design your ideal Ecwid eCommerce store in seconds. Click on the eBook or the button below. Save time searching for codes in the Ecwid forums and support site! Everything you need is all in one place in this eBook. Learn how to Change, Add, Remove and Edit Items to design your ideal Ecwid eCommerce store in seconds. The first way you can design your Ecwid Store this is using the buildtin Ecwid Design Panel. Note: If you are using Wix, changes made in the Ecwid backend may not show in the front end. The reason is you need to make these changes directly in Wix. Ecwid CSS allows you to customize the look and feel of your Ecwid store. I promise you will not actually have to code or program anything! All the code you need is available in my Ecwid CSS eBook. If changes do not apply automatically, make sure to clear your browser cache. There are tons of codes on Ecwid’s support site in the forums. But some of the codes are outdated now because they made some recent changes. Click on the eBook below to get over 110 Ecwid CSS ebook to customize your online store. All you have to do is copy paste the code and adapt it to your needs. It’s a great way to allow you to create your custom Ecwid theme. Learn more about Ecwid CSS Codes and store design in this article on my blog. A third way you can create an Ecwid theme is using an app in Ecwid’s app marketplace. However you will have to pay attention to pricing. Now if you’ve tried all of these methods and you found that you weren’t able to customize your online store to match your brand the way that you would like then, here’s another alternative. You can use a CMS or a content management system. You might have already heard of WordPress, Wix or Weebly. These are all content management systems, and they allow you to create and design websites. You might already be using WordPress and if you’re looking for an Ecwid-specific Theme to design your Ecwid store on WordPress. You will find lots of things that exist online but they’re not Ecwid specific themes. They’re actually WooCommerce themes, or general themes just for WordPress. You could pretty much use any WordPress theme. A good example of that is my own website. Head over to daniella.io/store and you’ll see a normal WordPress website. It’s not an Ecwid specific theme. It’s not an eCommerce theme. It’s just a very simple WordPress theme, and then I added my Ecwid store right within that theme. What I’m getting to is that you don’t need an Ecwid specific theme to customize your WordPress site and integrate your online store. If you would like to design your Ecwid site quickly and easily, I recommend Elementor for WordPress. It allows you to build a custom WordPress theme quickly and easily! Another content management system that you might want to have a look at is Wix. It’s important to know that if you’re using Ecwid with Wix then you don’t need Wix’s eCommerce solution and you don’t need their paid eCommerce themes. You can simply choose whatever Wix theme you would like and design it to match your brad. Wix is the best solution to go with if you would really like to customize your online store and get it to match your brand quickly and easily. Use Ecwid CSS codes to do so. 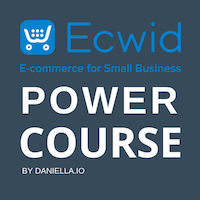 If you would like to learn more about how to customize your online store and design it to match your brand, please check out my Ecwid eCommerce power course. I also talk about the difference between WordPress and Wix in detail in that course. If you did not find what you are looking for in this article you may need custom development. A drop-down to select product quantities. Oblige customers to select a certain quantity of products to be able to checkout. Display slider buttons to scroll between products. Change the way bulk pricing works. If you are looking to change the way your Ecwid store works, then you will need to contact Ecwid and request custom feature development.